Abandoned houses have always struck me as rather sad. Houses that are half torn down – even sadder, as if the inner secret life has been exposed to the elements and all eyes. To see the layers of wallpaper ripped and torn, each surface revealing a past time, a past birthday and celebration in the house’s history, then to see the building in it’s final death throes is quite disturbing to me. Sculptor Rachel Whiteread (b. London UK 1963) is famous for her exploration of the negative space surrounding objects. In 1993 she won the Turner Prize for her exhibit ‘House’, a concrete cast of the inside of a Victorian terrace house: the negative space. The house was the last standing in the street and has since been demolished. ‘House caused a lot of controversy at the time and attracted lots of media attention. 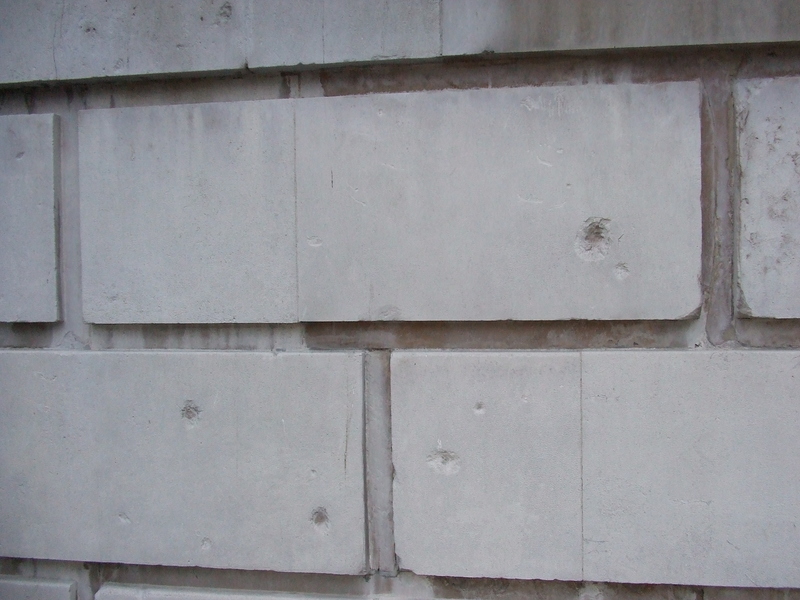 Whiteread explains how she felt about the piece and some of the problems she encountered. Ghosts of the past – Walk This Way! No trip to London is complete without going on an organised walk (or two). What better way is there to inbibe the history as well as getting good exercise? 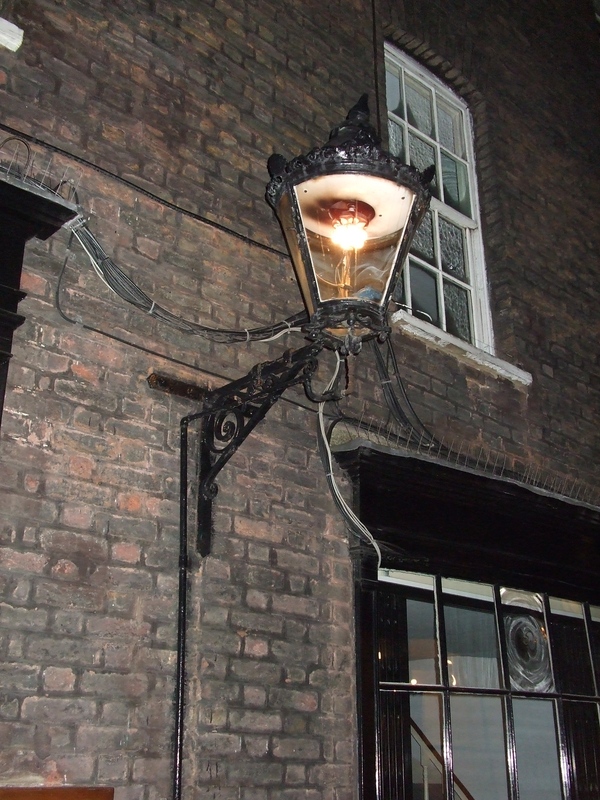 According to the Walking guides, it is ‘The Jack The Ripper’ walks that are the most popular. They can get up to 300 people at any one time: they need 3 guides for that! We went on one a long time ago and have never forgotten it. Those locations are still there and that’s part of the fascination I suppose; that ‘On this Spot’ etc. Armed with the fact, theories and the tourist’s imagination, a vivid picture soon emerges. Another walk we went on a while ago was ‘Bohemians and Bluestockings’. This walk explored the lives of artists and writer that lived in Bloomsbury and Fitzrovia in the 1920s and beyond. It was a very windy day and some building work was going on. We staggered round with our hair on end and sand in our eyes. You could spot the Boho’s in our group…. It was very interesting though. Walk your own way…. This trip though we went on 2 walks; ‘The Blitz’ and ‘Apparitions’ Alleyways and Ale’ . Both were with Londonwalks: both were excellent. The Blitz walk was with Helena. 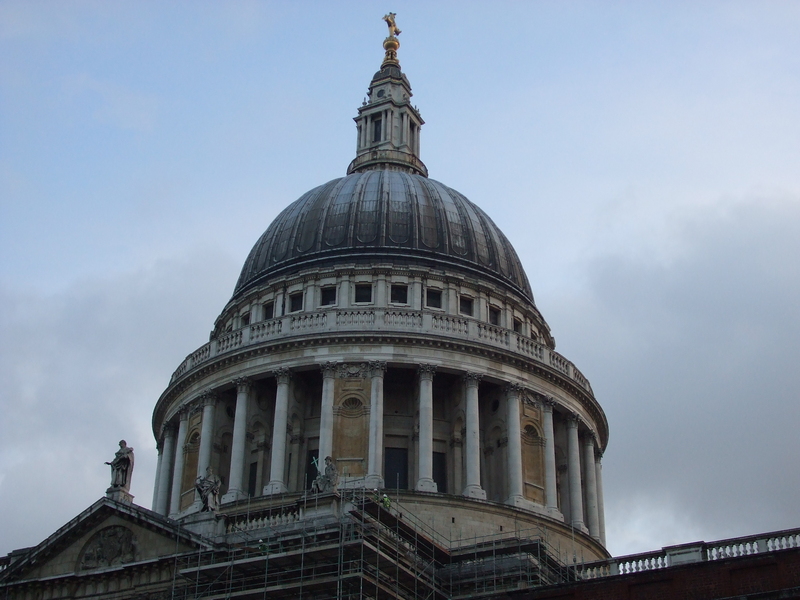 This walk is centred around St Pauls and surrounding area. The empathy and respect she has for her subject, not to mention the painstaking knowledge and research she has put into her presentation is admirable. I’m not going to give a running commentary of where we walked , that would defeat the object. Suffice to say that Helena’s facts and anecdotes bring the scenes of the London Blitz alive. Her cut glass accent sometimes breaks into broad cockney to retell a particular anecdote, the contrast shows a keen sense of humour and also a bit of acting ability, trying to bring the scene alive for the walkers. 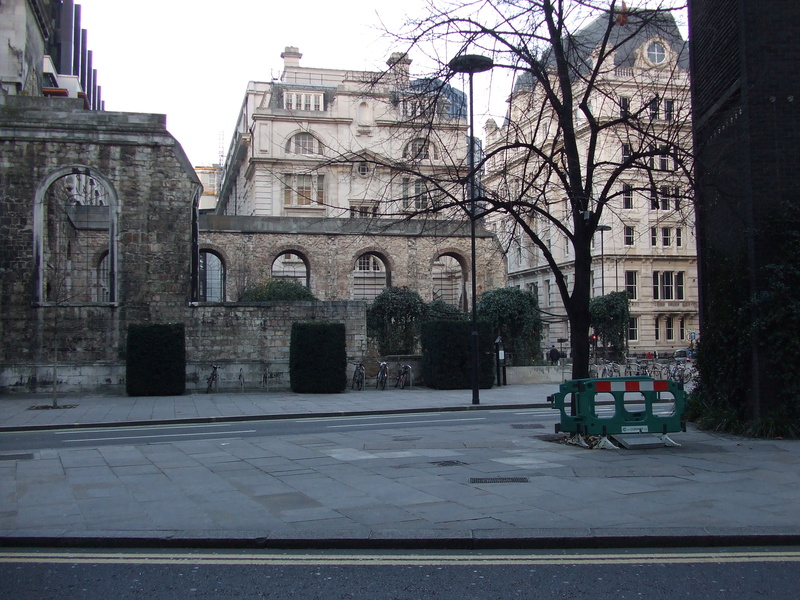 ‘Apparitions, Alleyway’s and Ale’ is a walk led by Russell Richardson. And what a great walk it is! Alleyways aplenty there are and you even get to sample some ale halfway though the walk – and you will need it. Not for the squeamish. Russell is an excellent guide, who truely loves his work. He keeps an open mind on the subject., though has had some very odd encounters whilst on this walk. Again, I can’t give away all the stuff we learned or the route we took: suffice to say that if you go, you won’t be sorry. One allyway we went down, which is reputably haunted, we took photos. Imagine our surprise when we saw ORBS! 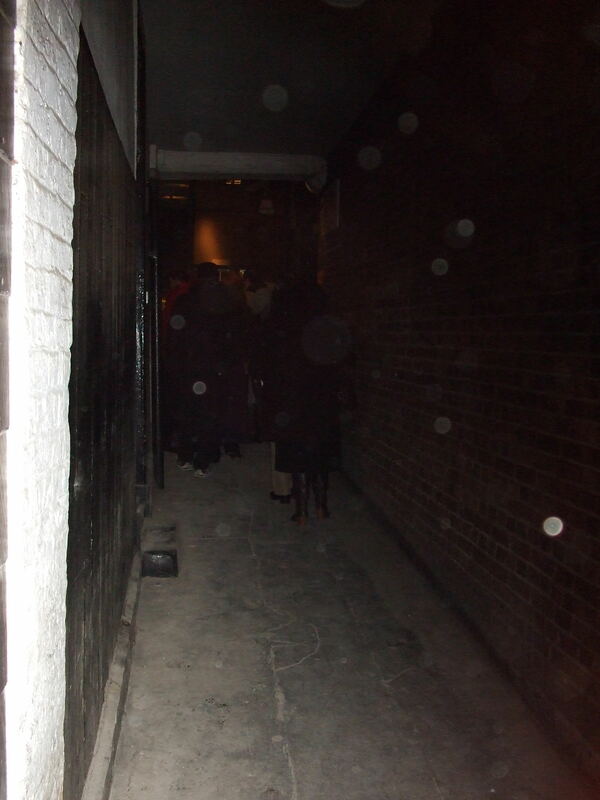 The figure in the black coat and boots is me by the way.